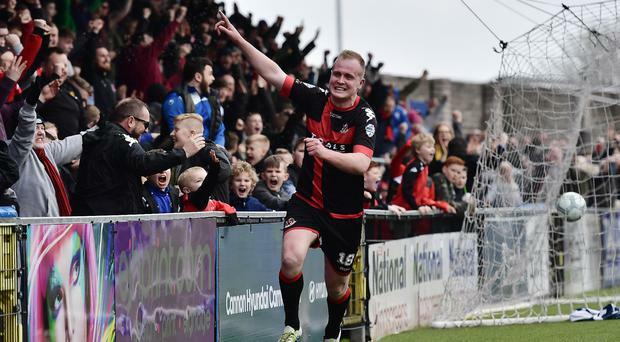 Crusaders striker Jordan Owens is sure that the Seaview men can handle the final day pressure in the title race and insists they are itching to get going against Ballymena United tomorrow. The Crues enter the weekend knowing that victory at the Showgrounds will be enough to win the Danske Bank Premiership. That's because, while they have the same number of points as second placed Coleraine who travel to Glenavon, they are miles ahead on goal difference. Owens, the record goalscorer for Crusaders, has already won two league titles and after the disappointment of missing out on Gibson Cup glory to Linfield on the final weekend last season, he has no intention of going through that again. The striker will be a key figure for Stephen Baxter's side at Ballymena, where he could come up against his brother Kyle Owens, a shining light in defence lately for David Jeffrey's men. Ironically Kyle is set for a move to Seaview in the summer. Crusaders star Owens says that while it may be the most important match of the campaign with sub-plots aplenty, it will be business as usual for the table-toppers. "We'll have a normal build-up to Saturday. We'll train hard and everyone is looking forward to it," said Owens. "We are going to the last match of the season aiming to win a league title. People talk about pressure but these are the types of matches that you want to be involved in." Owens believes the Crusaders fans at the Showgrounds can provide inspiration for the Shore Road outfit, declaring their support in last week's 1-1 draw at home to Cliftonville was vital. "It was a tough game for us against Cliftonville because they are a good side but our fans kept driving us on and now the title race is going down to the wire," said Owens. "I know we will get a good crowd of Crusaders fans at Ballymena and they will be behind us every step of the way and we'll give it a really good go." There has been much discussion in Irish League circles this week about the Crues losing 3-0 to Ballymena last season which gave Linfield the chance to nip in and claim the championship. Owens is not worried about what happened a year ago. He claimed at the start of this season that Crusaders had the character to hit back from that pain and he has been proved right. "We'll not worry too much about last season," he said. "When we lost the title last season I always felt we would come back strong and I think the boys have done that," added the 28-year-old in his testimonial year. "We have shown real character this season and we will go to Ballymena looking after ourselves," he said. "We know they will make it tough for us but we'll go there with a good attitude and aim to get the win we need." The title race: In case you're not quite sure yet, it's between leaders Crusaders and second-placed Coleraine. Crusaders are away to Ballymena while Coleraine are at Glenavon tomorrow afternoon. They're separated only on goal difference but the Crues will 99.9% certainly be crowned champions if they win. Any slip, and the Bannsiders could sneak past. Crusaders are 22 goals ahead on goal difference, so if they beat Ballymena 1-0, Coleraine would have to win 24-0 at Mourneview to overtake. Europa League qualification: Third place could be significant if Coleraine win the Irish Cup. That would mean that third place in the Premiership is straight into the Europa League qualifiers without the need for the play-offs. Glenavon currently hold third spot, a point ahead of Linfield. Glenavon welcome Coleraine tomorrow while Linfield host Cup finalists Cliftonville. Europa League play-off dates: Semi-finals on May 9. Final on May 12. Relegation: It's tight at the top but even tighter at the bottom. Basement side Ballinamallard and Carrick Rangers enter the final day locked on points. Carrick have better goal difference by five so that's almost worth another point. Unless Rangers are duffed by at least six at Warrenpoint, the Mallards need something from their trip to Glentoran to have a chance of surviving the automatic drop. Whoever finishes second bottom goes into the promotion/relegation play-off against Newry City. Promotion/relegation play-off dates: First leg on May 4. Second leg on May 9.